If you like tea and you like a bath then this is the recipe for you! What exactly is bath tea? 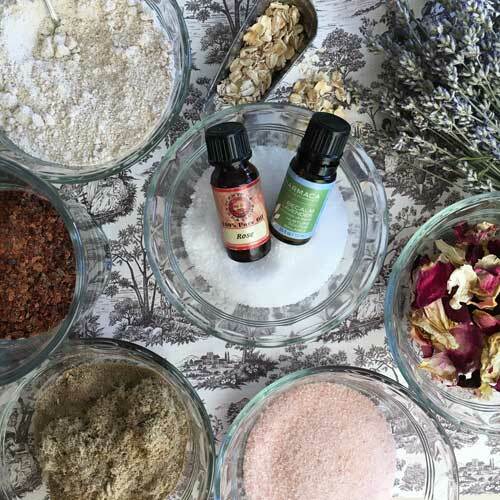 Well, it is a collection of herbs and natural ingredients that you can add to a cheesecloth or muslin bag which you can put in your bath water. Let the bag steep in the tub then soak and enjoy the benefits of the skin softening herbs and the aromatherapy of the essential oils. Doesn't that sound nice? It is really easy to make. Ground Oatmeal (Colloidal oatmeal): Colloidal oatmeal is just oatmeal that has been finely ground and suspended in a liquid. Finely grounding the oats makes them easier for the skin to absorb. Colloidal oatmeal can hydrate skin and it has certain compounds that are antioxidant and can reduce inflammation. It also cleanses the skin, removing dead skin cells. To make it, use a clean spice grinder and gluten free rolled oats. Ground the oats until they are a powder like consistency. Ground Dried Rose hips: Rose hips are the little red things that are left behind after the rose petals fall from the plant. They are loaded with vitamins C and A plus they contain antioxidants. I found them dried at the natural health food store. To prepare them, I used the spice grinder and ground them into a powder. Ground Marshmallow Root: I found this at the natural health food store and prepared it by grinding it in the spice grinder, as well. Marshmallow root is an anti-inflammatory and is known to have healing properties. Pink Sea Salt: Cleanses the skin by removing dead skin cells and by drawing out toxins. Epsom Salt: Epsom salt relaxes the nervous system. Rose Petals: Not only are these pretty to look at and wonderful to smell but they have the added benefit of being great for the skin. Rose water is an excellent toner, has anti-inflammatory properties, and is a great cleanser. Lavender Buds: These provide great aroma which can relieve tension. Get a nice big glass bowl and add one cup of ground oatmeal. Add 1/4 cup ground rose hips. Add 1/4 cup ground marshmallow root. Add 1/4 cup of pink sea salt. Add 1/2 cup rose petals. Add 1/4 cup epsom salt. Add 1/4 cup lavender buds. Add the rose and lavender oil. Use a wire whisk to combine until evenly blended. Scoop into a jar with a tight fitting lid until you are ready to use. I like to use glass ball jars. When you are ready to use it, get a muslin drawstring bag and add 1/3 cup then tie the bag closed (You can also use cheesecloth tied with twine if you do not have a muslin bag). To use: Hang the tea bag on the faucet and let the hot water run through the bag. Once you turn the water off, add the bag to the tub water, soak, and enjoy! What a fantastic way to start off your new year! Make a resolution to treat yourself in 2017. When you take care of yourself, that kindness gets paid forward to others! This can also make a great gift idea for someone special. If you liked this recipe, you may also enjoy these bath fizzies, bath salts, and/or shower fizzies. Take good care of yourself. You are worth it!